"...Tasteless, offensive and plain stupid. It is feeding a stereotype that is completely off base..."
The New Yorker magazine has received some backlash for this week's cover, showing Barack Obama dressed as a Muslim in the presidential Oval Office. 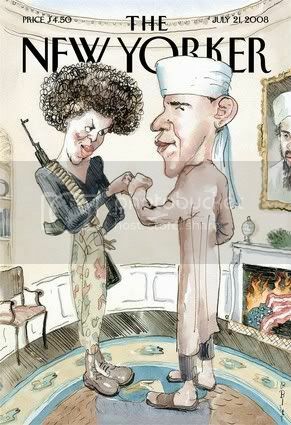 In the cartoon Obama is fist-bumping his Afro-wearing wife Michelle, who is outfitted with camouflage and an AK-47 slung over her back. The controversial cover, obviously meant to satirize false stereotypes of the presidential hopeful, has been accused of being too over-the-top. Readers called the cover racist and feared Americans would misinterpret the joke as being a legitimate representation of the senator.